You can configure one or several backup repositories in your backup infrastructure and use them as cloud repositories. A cloud repository is a regular backup repository configured on the SP side. When the SP creates a tenant account, the SP can assign a storage quota (allocates some amount of storage space) on this backup repository for the tenant. The tenant can be assigned different quotas on different backup repositories. As soon as the tenant connects to the SP, Veeam Backup & Replication retrieves information about all quotas for this tenant and displays a list of available cloud repositories in tenant's backup infrastructure. You can use a simple backup repository and/or scale-out backup repository as a cloud repository. 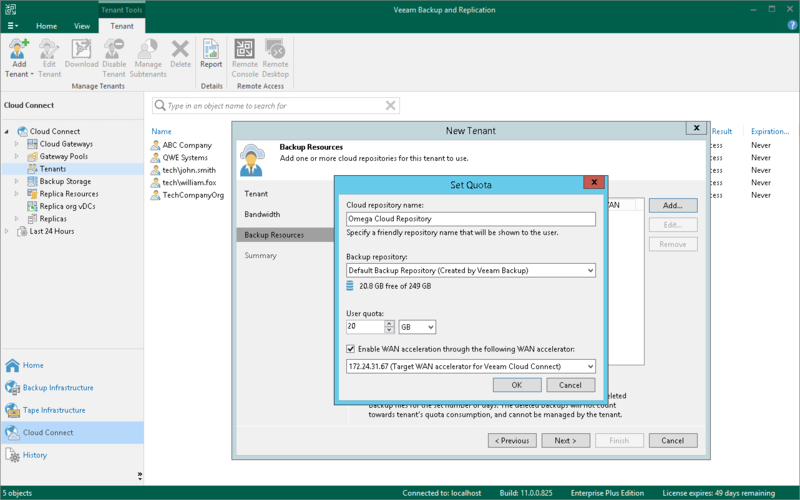 The configuration process of backup repositories in the Veeam Cloud Connect infrastructure is the same as the configuration process in a regular Veeam backup infrastructure. To learn more, see Adding Backup Repositories and Adding Scale-Out Backup Repositories sections in the Veeam Backup & Replication User Guide. When the SP exposes a new simple backup repository as a cloud repository, the SP should make sure that the location of this repository does not appear to be a subfolder of another backup repository location. For example, if the SP has already specified the E:\Backups folder as a location of a backup repository, the SP must not configure other backup repositories in the following locations: E:\Backups\Tenants, E:\Backups\Cloud, and so on. After a tenant or the SP performs a rescan operation for a backup repository configured in this way, information about tenant backups in the configuration database on the SP backup server will become corrupted.